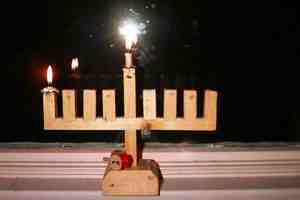 Something about the Festival of Lights attracts even this goy. Could it be the latkes? Could it be the stories of ancient freedom fighters? Could it be the powerful primal symbolism of candlelight flickering against the winter darkness, another small flame added each night until the once dark window is triumphantly ablaze with light?